Best Trampoline Mat Reviews: A high-grade trampoline is designed with all the top quality parts and components to make it immensely durable. It is robustly built so that it can last for several years without showing any structural issue. The trampoline mat that is fabricated into this fun equipment is made of premium fibers in order to effectively withstand harsh use and the changeable weather outside. But even after being manufactured from the high-quality material, it is very likely that these trampoline jumping mat may give up after a heavy-duty constant use. Sooner or later these mats may need replacements. Hence, we’ve decided to round up everything in this trampoline mat reviews. When heavyweights are continuously being put on the trampoline mat, the bounce feature of the mat reduces considerably. Harsh weather elements can rip the fibers on a trampoline mat. If the trampoline is placed beneath a tree, it can develop holes or unwanted spots due to the sticks fall on it. We have compiled some of the best trampoline mats here from the most renowned companies. These mats are usually the most purchased trampoline mat because of the quality and popularity. Go through our reviews below to find out more about the best replaceable trampoline mats and make sure they match your prerequisites. You can see & read detailed reviews on Amazon by clicking on the product link below. 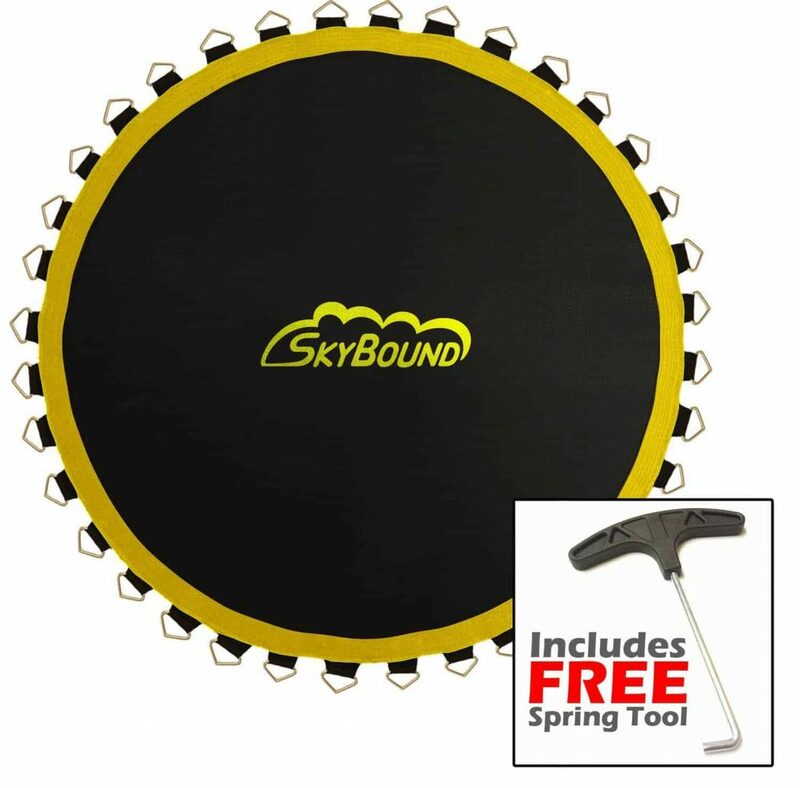 This replacement mat from SkyBound is extremely beneficial for someone who is looking to bring the same bounce back to their trampoline with which it came. This trampoline mat is available for different sizes of the trampoline with varied numbers of springs and their size. It is made with high-quality fabric so as to outperform even the original mat that came with your trampoline. 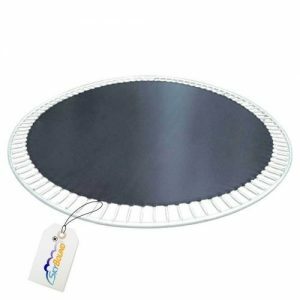 There is a particular size for 14 feet round trampoline with 72 v-rings incorporated in this replacement mat. The springs are not included in this mat and it is compatible with 6.5 or 7 inches springs. You must measure your springs without stretching i.e. from hook end to other hook ends. The extra strong stitching gives the longest life to this mat and also ensures maximum security. This premium quality replacement mat is available in various sizes so as to accommodate every need. From the very basic size to a bigger 15 feet trampoline mat, this mat can be used in numerous trampolines. A top-notch Permatron trampoline fabric is used in the fabrication of this mat for ensuring efficient resistance against punctures and weather issues. Zinc attachment rings are incorporated for easy and effortless installation that interlocks the mat sturdily. A 180-day warranty from manufacturer undoubtedly makes it a great deal for anyone who is still doubtful of its quality and utility. So, get the right measurements for your trampoline and make sure that you purchase a flawless and perfect-sized trampoline mat. What makes this replacement mat from SkyBound different from others is its long warranty of 3 years on stitching and of 5 years on the all-inclusive mat. They are extremely durable to withstand heavy use that usually comes from your children and also the harmful UV rays of the sun. This premium replacement mat is outstanding when it comes to bear the extreme tension of the springs when they are pulled continuously. The innovative SunGuard incorporated in this mat is immensely efficient in extending the life of this mat. Extra rows of hard-wearing stitching and sturdy V-rings are chiefly responsible for an enhanced bounce on your trampoline. Highest grade materials used in the fabrication of this mat have impressively made it resilient and long-lasting. Losing the bounce of your trampoline is just like losing the overall fun of bouncing. Therefore, if you want to reinvent the same level of trampoline jumping once again in your old trampoline, this new and sturdy UpperBounce Trampoline Replacement Jumping Mat is exceptionally good. It features ultra-durability because of its premium PP mesh material and eight rows of stitching. This strong stitching prevents the mat from tearing so that you can enjoy bouncing on the trampoline for many years. This mat also comes with a six-month warranty from the manufacturer. It is a UV-resistant, water and fade proof mat to make sure that your trampoline looks like a brand new for several years to come. It also has galvanized steel v-rings to sturdily hold the mat in its accurate position. So, if you have been looking for a trampoline replacement mat, these best trampoline mats will definitely retain the high bounce of your equipment. A trampoline is no trampoline without a bounce. After all, the bounce is what we want while jumping. If your trampoline mat has given up after a continuous use, it is always advisable to replace it with a new one for safety concerns and for the overall entertainment too. These trampoline mat reviews are compiled for making sure that all the homeowners can easily get a common podium to buy the best trampoline mat. Skybound Premium Series Trampoline Mat comes with an industry leading 2 year warranty. SkyBound’s Premium Series Trampoline Mats are manufactured with extra attention to detail, utilize the highest grade materials available in the industry, and come equipped with extra rows of heavy-duty stitching and thicker steel v-rings to boost the bounce of your trampoline!